The Eintracht-Stadion is a multi-purpose stadium best known as the home ground of German football team, Eintracht Braunschweig. The ground has a modest capacity of 24,406 and is notable for the running ring around the perimeter of the pitch, as well as for hosting American football matches for the New Yorker Lions. 3 Matchday Transport – How to Get there? Eintracht-Stadion originally opened in 1923 with a 28,000 capacity courtesy of wooden stands which permitted standing for those wants to watch the match. The inaugural match was held between Eintracht and FC Nürnberg on the 17th June and ended in disaster when the visiting side trounced Die Adler (The Eagles) 10 – 1 which has to go down as one of the worst opening results at a new stadium of all time – if anyone is comparing them that is! In the late 1950s and early 1960s when Europe and Germany was beginning to economically recover from the Second World War, and football began to grow in popularity, Eintracht’s stadium underwent a first phase of expansion in 1963/64 where the capacity was increased to 40,000 which spurred on to become Champions of Germany in 1967, winning the league by 2 points ahead of defending champions 1860 Munich. 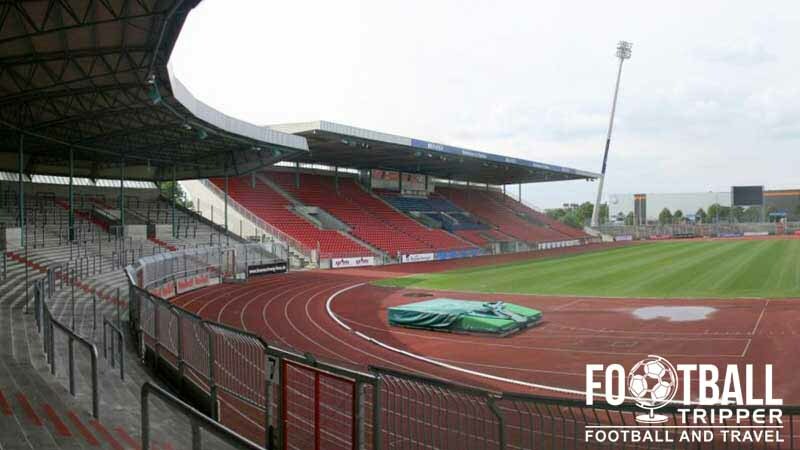 The period after this triumph saw the stadium, initially known as “Municipal Stadium of Hamburger Straße” become a collection of outdated facilities, with the wooden structure of the main stand and other parts of the Stadion falling into a state of disrepair. 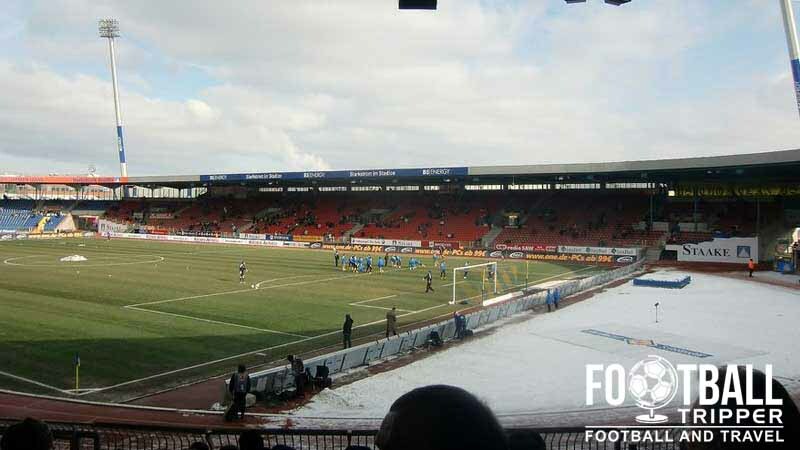 With relegation to the second division and near bankruptcy, Eintracht had to temporarily shelf plans for their ground until the mid 1990s when they could afford to rebuild. Constructed began in 1995, with the entire stadium being completely rebuilt from the ground up with most notably the South Stand becoming fully covered and East Stand converted into an all seater grandstand, not to mention the addition of powerful new floodlights and an electronic scoreboard. The now 25,540 capacity Eintracht-Stadion is certainly in good shape with the club recently planning a reconfiguration of the Northern Stand for 2013/2014 season. Eintracht FC is a neatly compact stadium, with the configuration of the stands creating an elliptical shaped structure due to the existence of the Athletics track around the perimeter of the pitch. As the 34th largest stadium in Germany at just over 25,000 you shouldn’t worry too much about being far away from the pitch no matter how expensive your tickets are, although obviously things would be much better for fans if the stadium was configured solely for football. With one German Championship to the club’s name in 1967, Eintracht Braunschweig are hardly the most successful football team in Deutschland with recent promotion to the Bundesliga for the 2013/2014 season heralded as a fantastic achievement the club, leading on from a period of stagnation in the second division since 1985 – over 20 years. Unfortunately their top flight status was short lived with a 3-1 away defeat to TSG 19899 Hoffenheim sealing their fate on the final game of the season. No matter what division you see the club play in, you’re set for a lively atmosphere with the 21,396 average attendance for the 2011-12 season putting Eintracht Braunschweig as the 24th most supported sports team in Germany which is very impressive. The distinctive club colours of blue and yellow have their origins with the former Duchy of Braunschweig and provide an intimidating wall of colour for teams who visit Eintracht-Stadion. The club’s biggest rivalry is undoubtedly with Hannover 96 with both clubs hailing from the state of Lower Saxony in the North of Germany. Eintracht Stadion is comprised of four stands: North, East, South and West. Located towards the North of the city on “Hamburger Straße” which is essentially out of town, Eintracht-Stadion doesn’t have loads of eating and drinking options located nearby, but as this is Germany, you can always rely on the stadium itself offering a fine set of refreshments, mainly in the name of beer. If you must get something outside of the stadium then there is a small congregation of shops towards the South East of the ground such as Pizza Family on Mittelweg road. For regional cuisine , the Internationally renowned Braunschweig sausage is definitely worth trying, as it is a staple of the region, and is even popular as far away as the United States where it is common to ask for “Braunschweiger”, although the garlic relish is strictly a German invention. The next most famous speciality of the region is Asparagus with popular accompaniments being chips and ham or smoked Salmon, and then cabbage, “Braunschweig”. Beerwise the city has excellent breweries with Hofbrauhaus Wolters and Feldschlößchen Brewery (Oettinger Brewery ) and the smaller Schadt being three of the best examples. Eintracht Braunschweig FC operate two club shops throughout the area, in addition to their online store. You can purchase a wide range of memorabilia as well as tickets for both the stadium and transport to get there such as Buses and where necessary train. Address: Eintracht Frankfurt Fanshop, Ritterbrunnen 7, 38100. On the day of matches, the stadium is usually open for 2 hours before kick off. On non-match days (including weekends) and holidays is remains closed. Address: Eintracht Stadion Fan Shop Hamburger Str 210 38112. Eintracht Braunschweig FC offer fans the chance to take a behind the scenes look at their beloved stadium with the creation of their stadium tour. The 90 minute journey starts at the gift shop and if you want, can end in the “True Love” club restaurant which is very reasonable priced with a main and beer offered at just under €9.00, with the children’s menu costing closer to €6.00 euros. The tours are capped at a size of 25 which ensures you have lots of space to take photos and the opportunity to ask questions, with Stefan Lindstedt the highly knowledgeable stadium announcer even conducting two of the tours each month himself which will give those luck attendees unparalleled insights and anecdotes. You can either choose to book tickets for just the stadium tour or for a few euros more you can include a visit to the exhibition as well. Discounts are also available for groups greater than 10 with a price reduction of 1 euro of all tickets, and you can book your place on the tour either online by emailing [email protected] or by purchasing your tickets at either of the club shops. Tours usually occur 2-3 times a month with the most up to date information available here. Tickets to see Sportgemeinde Eintracht can either be purchased online, via phone (+49 0 1805 121895) or via either of the club shops (Stadium or city) listed previously in this guide. Unlike football matches in Italy, France and other countries in Europe, the Bundesliga and German football in general regularly sells out which means you’re strongly advised to book your tickets in advance to avoid disappointment. If the game isn’t sold out then you may be able to buy some tickets at the stadium on the day of the match but your chances of success are much lower than in other countries with the exception of England. 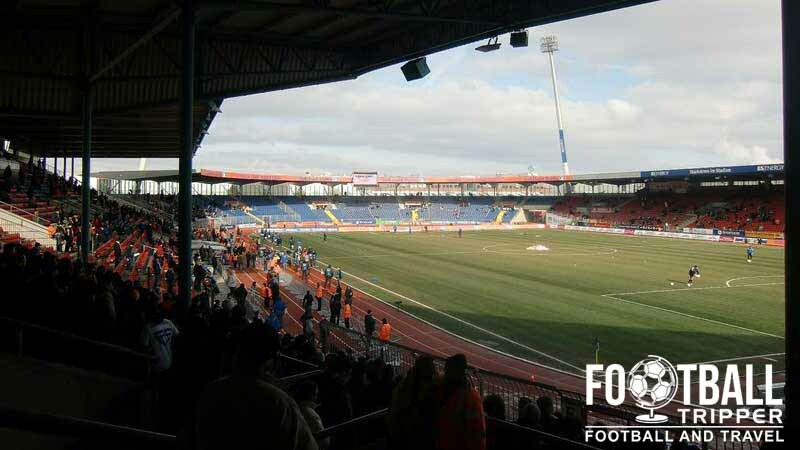 Price wise, Bundesliga is very affordable with a place in the terraces (standing) starting at €16.00 with a seat behind one of the goals from €24.00 and the main stand averaging around €33.00. Matchday Transport – How to Get there? 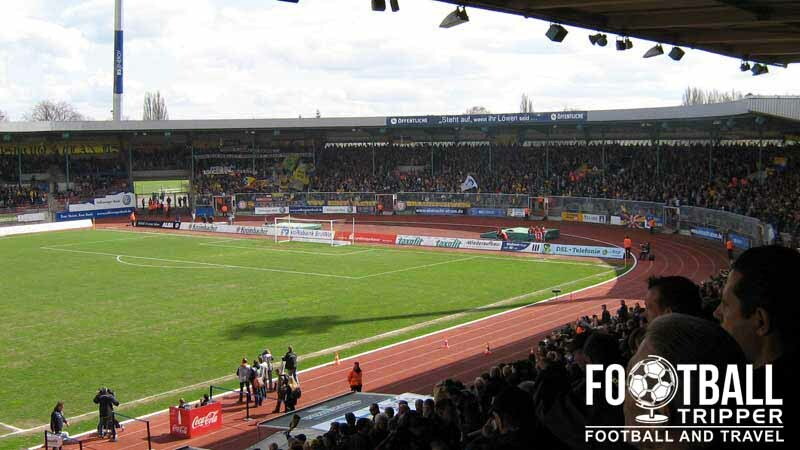 Eintract-Stadion lies to the North of Braunschweig, approximately 2.5km from the historic city centre and around 5.0km away from the main railway station which can be found further South. From the centre of town you’re looking at a stroll of approximately 30 minutes with the easiest and most recognisable route is to walk along the Hamburger Straße road which lent it’s name to the original Municipal stadium. Once you have crossed the Oker river and are on the road all you need to do is follow it Northwards until the stadium greats you on your right hand side. There is a McDonalds along the road which serves as a handy marker. Braunschweig Hauptbahnhof (Main station of Brunswick) is around 1.5km from the Schlossmuseum and it will take you approximately an hour to get to the stadium. As the city is located very centrally within Germany, the train station is very well connected to the rest of the country with Deutsche Bahn providing high-speed rail access to other important European destinations. The easiest way to get to the Stadion Eintracht is probably via the tram, with both lines (M1 and M2) stopping at stations which are close to the ground. From either the main train station or the city centre (Rathaus and Hagenmarkt), M1 requires you to get off at the “Stadion” stop and M2, “Gesundheitsamt”. The journey will take you just under 20 minutes from the railway station and only 10 minutes from the historic city centre. Additional trams serve the lines on match day so don’t worry about it being overcrowded or having to get their too early. The Stadium is well connected to the A391 motorway via the Hamburger Straße main road which is easily identifiable on a map. From the North, East and West take the A2 Hanover-Berlin until exit 55 (Braunschweig-Nord) and then continue along either the A391 West Bypass or A392 Bypass and then exit onto Hamburger Straße. If you are coming from the South, take the A391 North crossing the A7 Kassel-Hannover and then look for the same Hamburger road exit. A decent place to park is at Schützenplatz, 500 meteres away from the Hamburger Straße city junction which is has numerous parking spaces, and is only 5 minutes walk from the stadium. The closest airport to the city is technically Braunschweig-Wolfsburg Airport but unfortunately it is only used as a cargo and private aeroplanes with it’s history lying in Military use in the 1930s. This makes Hannover Airport the nearest, and it will take you approximately 30-40 minutes by car, or an 1 hour via train. There are numerous shuttle services which run from the airport and you needn’t worry as public transport in German is very good. There are numerous hotels located along K2/Hamburger Straße which is less than 5 minutes from the Eintracht Stadium such as Stadthotel Braunschweig, Hotel Gifhorn and Hotel Innenstadt. Back within the city centre which is encircled by the Oker river, there is also decent choice with Best Western Stadpalais and City Partner City-Hotel Braunschweig being two slightly more expensive but reliable options to take a look at.